So happy I made this purchase. Very well made and looks more expensive. 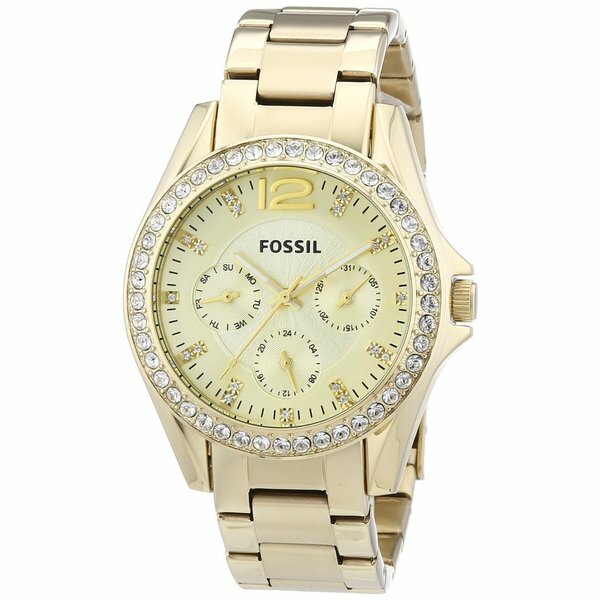 Keep time beautifully with this Riley women's mutifunction watch by Fossil. Crafted of goldtone stainless steel, this watch is as durable as it is elegant. Lavishly set with multiple crystals surrounding the stainless steel dial and at the hour markers, this Riley watch makes a sparkling addition to any ensemble. Accurately keep time with the quartz movement housed in this water resistant, stainless steel casing. Three sub-dials keep you current with the calendar day and date display, while the three luminescent hands make it easy to tell time down to the second, even in the dark. Just as pictured. Very nice watch! "Any changes in color or tarnishing? How long have you had the watch?" The Fossil ES3203 will usually not tarnish if cared for properly.